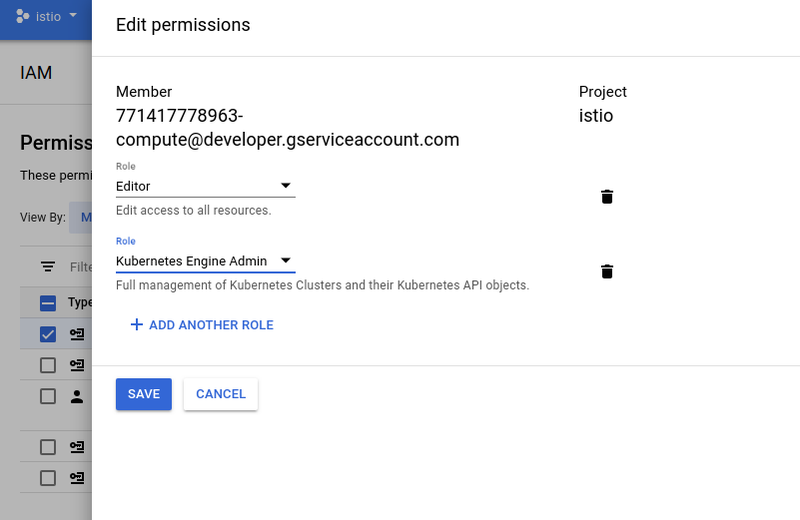 Quick Start instructions to install and run Istio in Google Kubernetes Engine (GKE) using Google Cloud Deployment Manager. 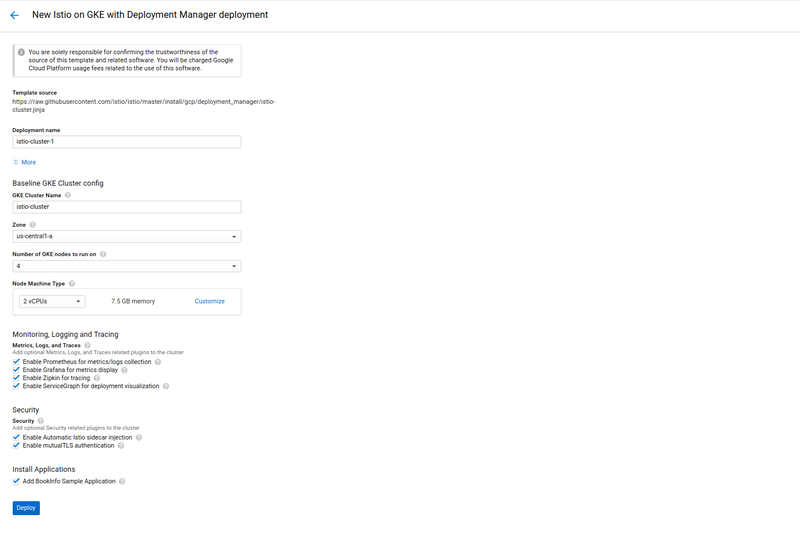 Once you have an account and project enabled, click the following link to open the Deployment Manager. We recommend that you leave the default settings as the rest of this tutorial shows how to access the installed features. 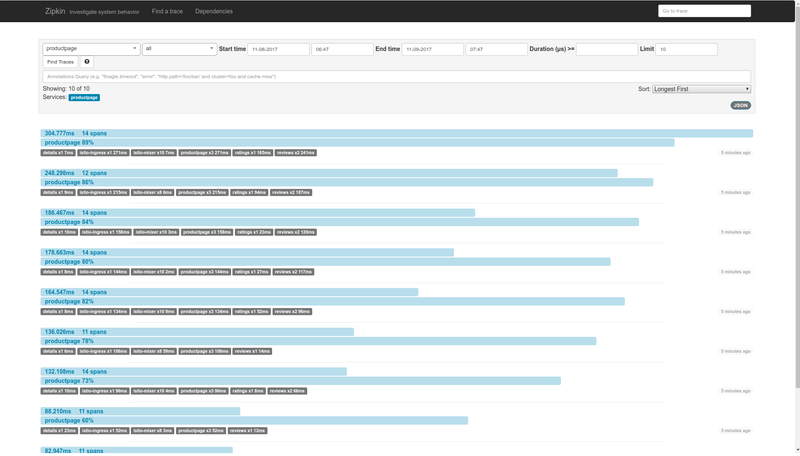 By default the tool creates a GKE alpha cluster with the specified settings, then installs the Istio control plane, the Bookinfo sample app, Grafana with Prometheus, ServiceGraph, and Zipkin. You’ll find out more about how to access all of these below. This script will enable Istio auto-injection on the default namespace only. Wait until Istio is fully deployed. Note that this can take up to five minutes. Note down the IP and Port assigned to Bookinfo product page. (in the example above, its 35.202.120.89:80. 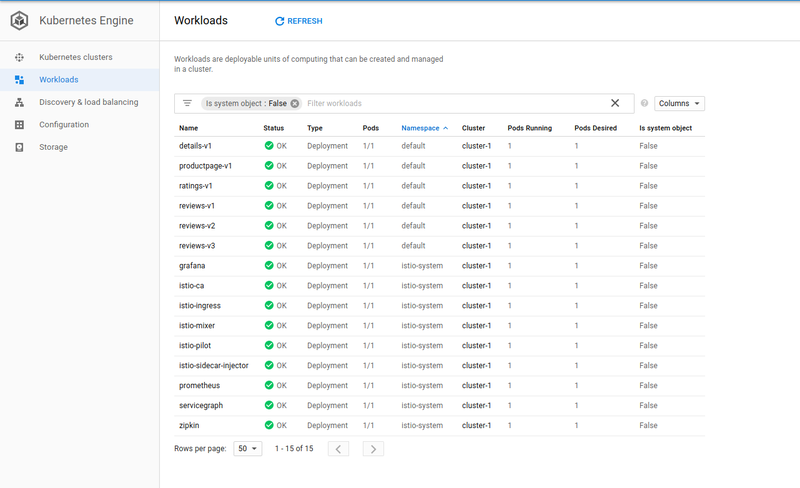 Once you have verified that the Istio control plane and sample application are working, try accessing the installed Istio plugins. If you are using Cloud Shell rather than the installed gcloud client, you can port forward and proxy using its Web Preview feature. For example, to access Grafana from Cloud Shell, change the kubectl port mapping from 3000:3000 to 8080:3000. You can simultaneously preview four other consoles via Web Preview proxied on ranges 8080 to 8084. You should see some statistics for the requests you sent earlier. For more details about using Grafana, see About the Grafana Add-on. For more details, see About the Prometheus Add-on. 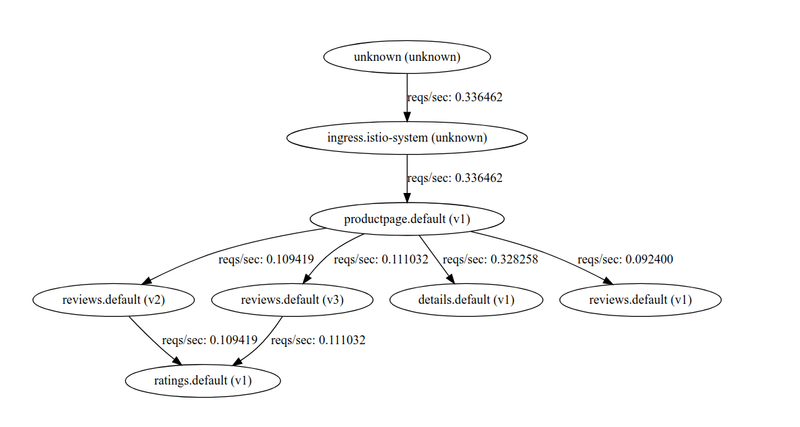 For more details, see About the ServiceGraph Add-on. For more details on tracing see Understanding what happened. You can further explore the Bookinfo app and Istio functionality by following any of the tutorials in the Guides section. However, to do this you need to install istioctl to interact with Istio. You can either install it directly on our workstation or within Cloud Shell. Select the deployment and click Delete.